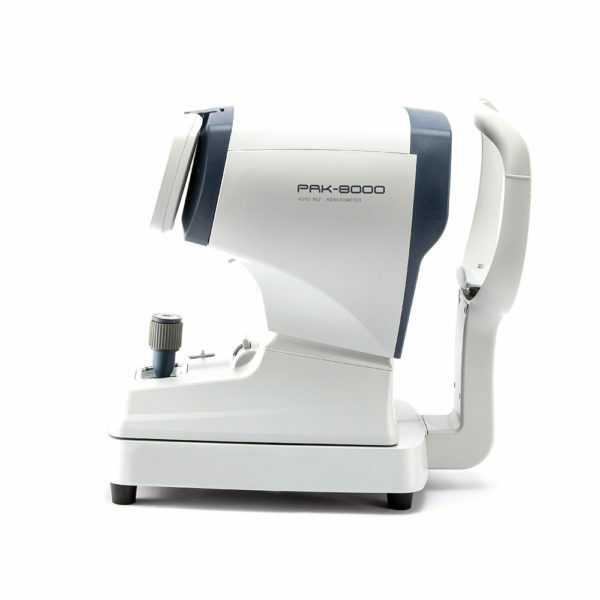 PRK-8000 provides an extensive dioptric measurement range [-30D to +25D] compared to our previous model, and the radius of curvature for keratometry is 5.0mm to 13.0mm. Easy alignment and friendly operation allowes you to measure the refraction and keratometry in sequence, and the results can be validated immediately. Owing to its easy alignment and friendly operation which you can measure the refraction and keratometry im a sequence, the results can be checked all at once. 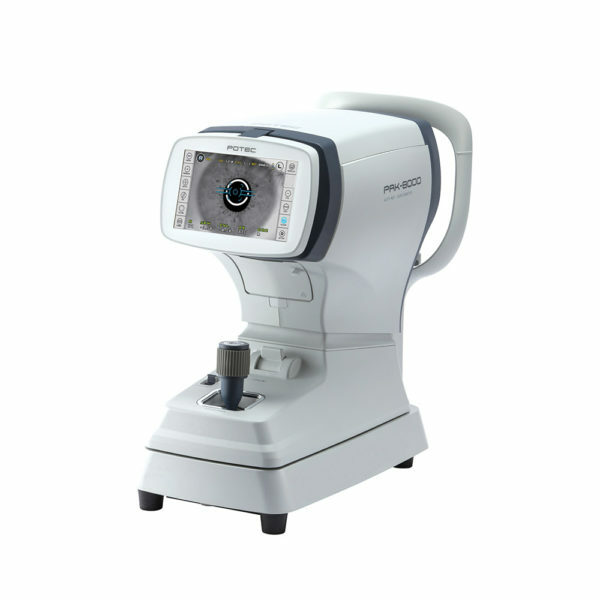 Peripheral conrneal curvatures can be measured by having the examinee look at the peripheral eye fixation lamps. Measuring the corneal peripheery will help you examine irregular astigmatism, and also determine a better fitting for a contact lens. 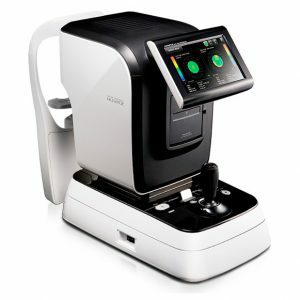 Using the freeze function, measurement of the diameter of the cornea, pupil or hard contact lenses worn by the patient can be performed. By simply touching and dragging the screen with yiur finger measurements are exactly calculated. World’s fastest measurement is provided through greatly improving its speed as compared to our previous products and the products of our competitors. An optician can help a patient easily understand if he or she needs to wear progressive lens through pre-correction visiov simulation. The patient can compare the effects before and after correctin through short-distance vision simulation. 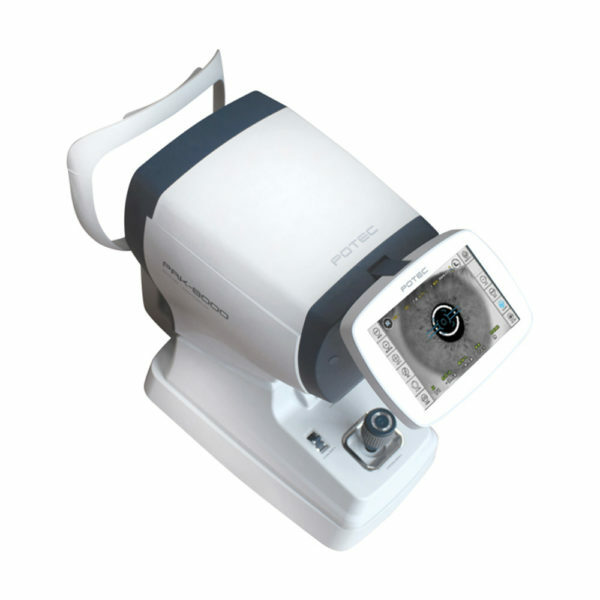 With our improved ILLUM mode, any opactiy[cataract] in the crystal or fault of the contact lens are visible on the monitor by the method of projecting light on the pupil. 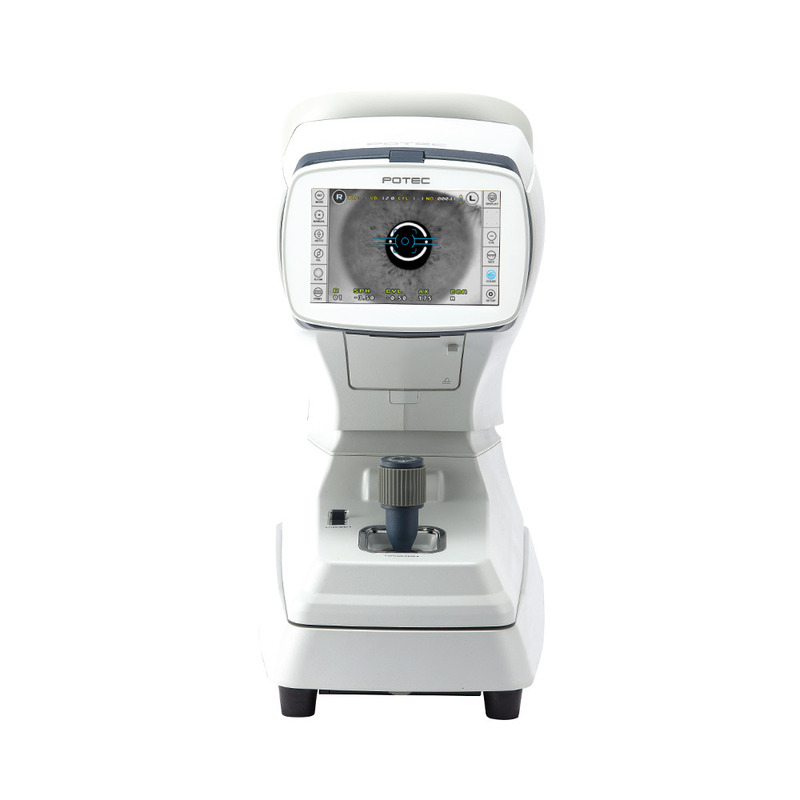 Ten images of each eyeball and results of measurement are saved, enhanced display control enables simultaneous checking of measurement images and results. A user can select between two colors for the user interface. By adopting high resolution VGA TFT-LCD with touch Screen function, we virtually removed all input keys except the measurement button on the joystick and Chinrest control, switches. Tests are performed rapidly and conveniently by simply pressing a button or the icon indicated on the screen. Also, user can use the Key button as convenient function. By simply touching the icon on the screen results of up to 10 measurements stored in memory can be viewed or printed by the built in thermal auto cut0off printer. Simply tiuch the icon on the screen and changed settings can be seen. The touch screen supports interactive setting changes quickly and conveniently saving user time innovatively. The chinrest is motorized with the use of a switch conveniently positioned for the operator. This makes for simple adjustment of the chinrest from patient to patient. There is the motorized chinrest which makes user easy to control by the simple switch pressing up and down. PRK-8000 immediately provides a complete printout of the measurement result and an auto cutter is provided fo convenience. And there is economy mode of printer which makes printer paper saved by being well arranged and amended letter size. Data can be transferred to external devices [personal computer, etc.] via an RS-232 interface. A USB interface is also provided for future compatibility. User can send the images of patient’s eyes through USB port and have faster S/W upgrade by the PC program provided as option. 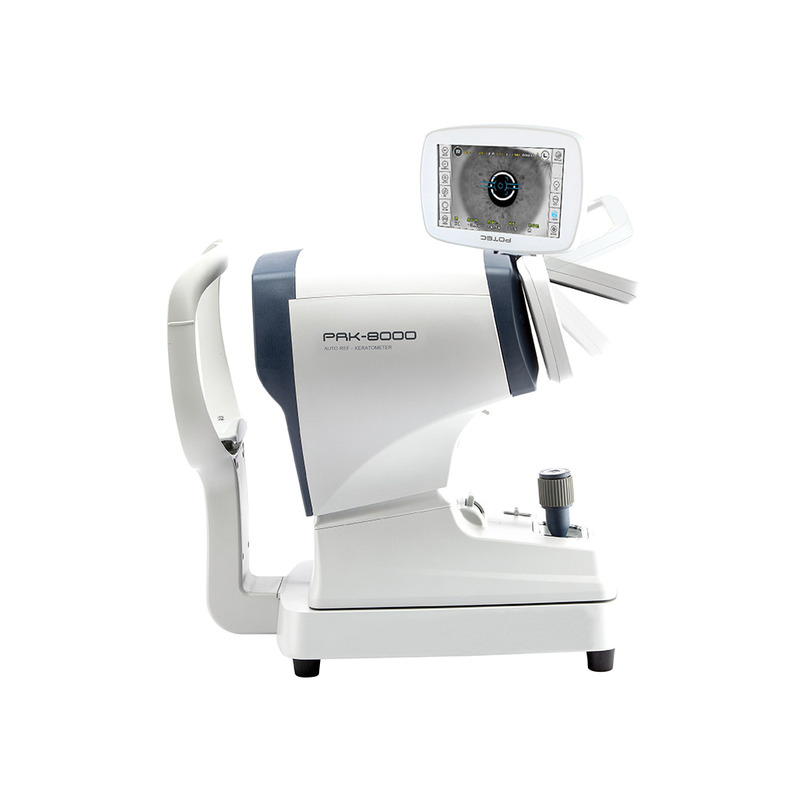 Our new enlarged [800X480] LCD monitor gives 180˚ up & down 135~145˚ left to right versatile accessibility to a user for inspecting patient eye more conveniently. 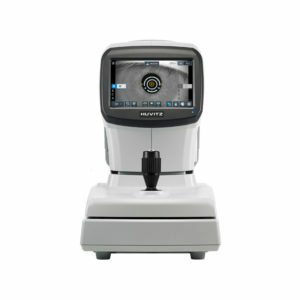 The pupil position detecting automatic height adjustment system reduces measurement time. By only clicking a button, user can switch the mode from Auto to manual tracking. 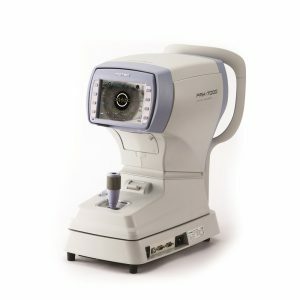 Measurement convenience and accuracy are increased by adding lever-handling guide images designed to easily track eyeball focus. 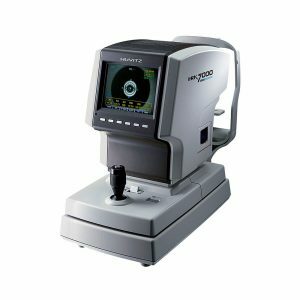 The no-load joy stick ensures softer and enhanced eye examination, as it can determine a point of time for measurement without vibration and more accurately than the previously adopted belt type even while the measurement head is moving up or down. 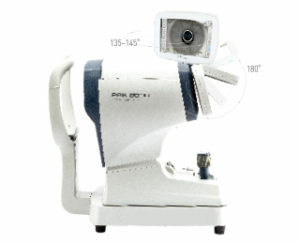 User can fasten the main body by simple control.